Rolled up crepes filled with ham, grated cheese and mushroom sauce, covered in crème fraîche and baked in the oven. A traditional meal of cooked, sliced onions and pork in a cream and wine vinegar sauce. Served cold. This soft cow’s milk cheese comes from Maroilles and is protected by an AOC label. It is sold in blocks and has an orange rind and a strong smell! Guerbigny is very similar. A cheese from Rollot, near Amiens. 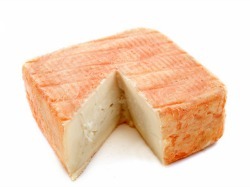 The soft cow’s milk cheese was originally made by monks at Maroilles Abbey and was popular with Louis XIV. It comes in round and heart shaped varieties. Crème Chantilly takes its name from Chantilly in Picardy. You can still visit the site – a hamlet within the grounds of Chateau de Chantilly – where it was invented. A caramel spread made with milk from the same Thiérache cows involved in making Maroilles cheese. Try spreading it on toast, in tarts, cakes and pices. Ten percent of champagne is made in the south of the Aisne department in Picardy. The wine producing region of Champagne-Ardennes is located next to Picardy. Another speciality of Amiens, dating back to 1643. Le pâté de canard is often served ‘en croûte’ (wrapped in pastry). The local haricots from Soissons make a wonderful thick soup. But somewhat surprisingly, they’re also used to make sweet dishes! Meat from the sheep that graze around the Bay of the Somme is known as agneau de pré salé – it has a unique flavour.